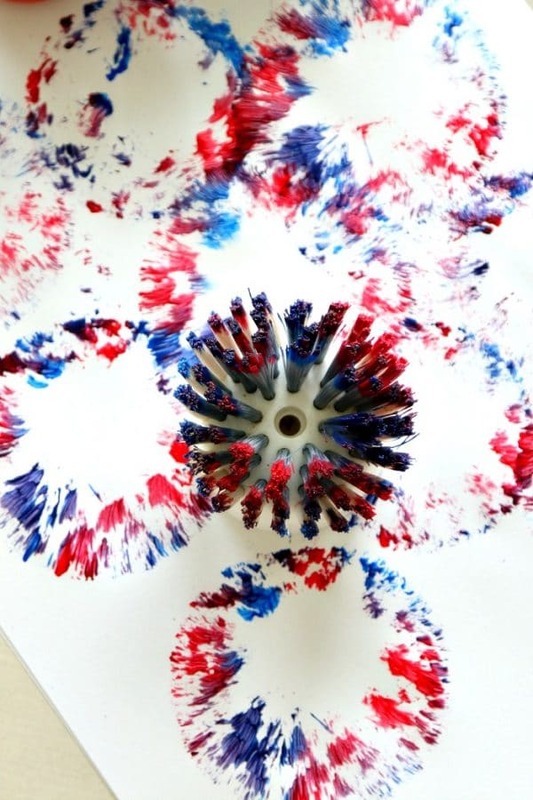 Yay for July 4th where we get to use Red, White, and Blue paint in everything! And this crafty art project is no exception. I think all the Freedom holidays like Memorial Day, 4th of July, Veterans Day and Presidents day are covered in ways to create fireworks and Phoenyx and Charlotte both love using different kitchen utensils to bring the fun! For this craft project, you can either use white paper (which I prefer) or black paper to bring out more of the white paint or just keep creating and do both! We just used a REGULAR paint brush to paint our design onto the bristles FIRST. You could dip the kitchen brush, but then it mixes the colors and can come out much more solid or purple and this way you get a bit of every color. 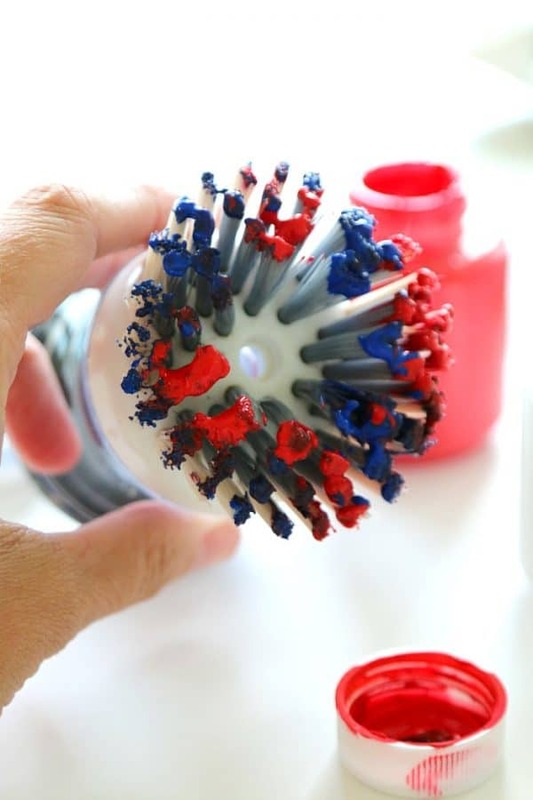 Once you have painted the bristles all the way around, you push down on the paper with your dish brush. If you turn it into circles it will smear the colors into a circle, so just pick up and push down, pick up and push down. 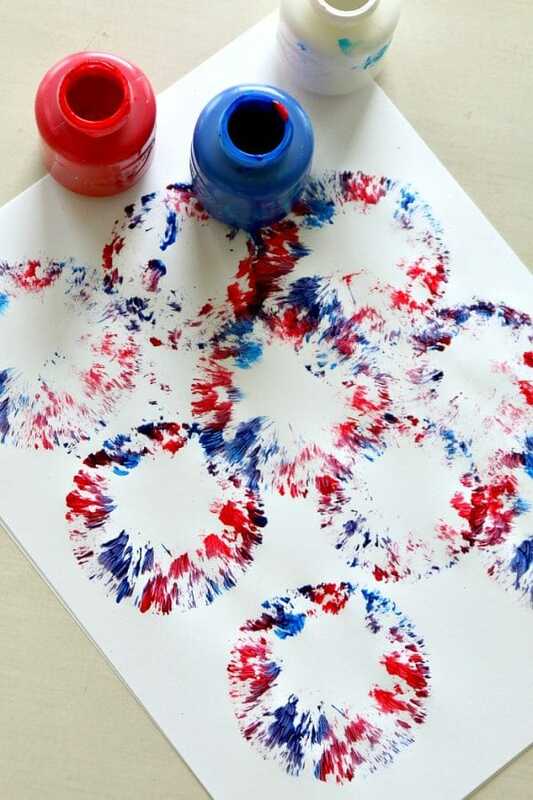 Don’t forget to pin this project here, check out other July 4th Craft Projects on MomDot Here, and follow our July 4th pin board for tons of great ideas from other great bloggers! So cool! I wish my son was still little to do this little project.